If you: Attended USC’s final spring practice session on a hot and clear sunny Saturday afternoon, you did so with the expectations that you’d not be entertained in the traditional sense of a spring game or a prolonged “live hitting” scrimmage for that matter. The media was encouraged to disseminate to the masses that Saturday would not be a formal spring game like an Ohio State or Alabama or even a prolonged scrimmage. While being billed as a “spring showcase,” most cardinal and gold fans had no high expectations and most elected to stay home or watch the proceedings on the Pac-12 Network, thus the smallest turnout – maybe 500 fans at best and that’s being generous – in my 56 years of watching the final USC spring game/scrimmage/practice. However, despite the week’s emphasis that Saturday would be “just another practice” and strong emphasis from university officials that the final outing would not be heavily promoted, it was a welcome sight by all when the Trojan Marching Band appeared, promotional tents with giveaways were in operation at the entrance to the stands, the tented Bookstore was selling an assortment of spirit items, and even USC Spring Football Media Guides were available for purchase. 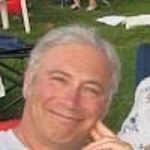 The only thing missing – and it was a big missing – especially for a practice that was being televised nationally – was the famous USC Song Girls, who must have interpreted the final spring day expectations as “don’t bother” and skipped the whole presentation entirely. 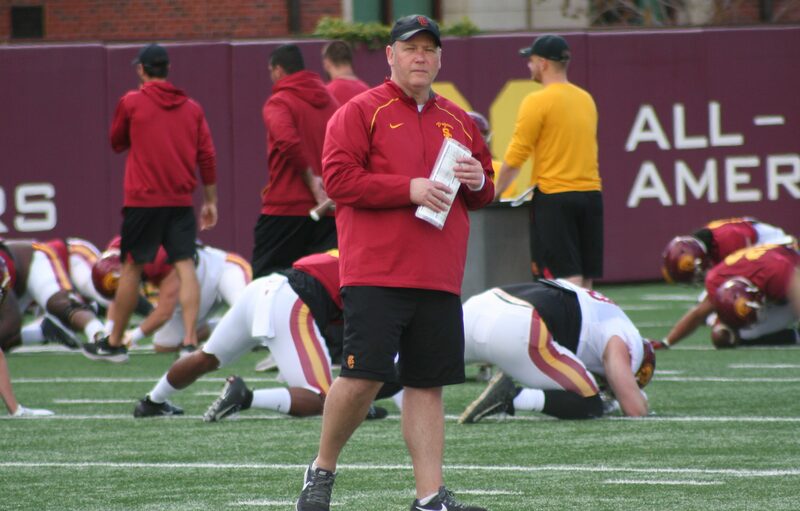 If you: Didn’t attend USC’s Saturday’s final spring practice session, we can’t honestly say you missed anything substantial, but the 11-on-11 situations were, at times, game-like intensity and some of the tackles were more than just “thud” collisions. Maybe the players and coach’s motivation to make it more than just a practice was because the Pac-12 Network was beaming live the USC finale nationally, so a lot of perception was on display. And did you notice on TV there were even game officials? Of course, if you don’t like being in the sun and the heat, you were actually better off watching the proceedings in the comfort of an air-conditioned living room. Afterward, Clay Helton was understandingly beaming by declaring there were no major injuries sustained during the 15 days of spring practice. If you: Attended USC’s Saturday’s final spring practice session, it was worth it because frankly it’s a long hiatus from mid-April to the first game on Sept. 1 against UNLV and more importantly, you were able to get a 70-minute glimpse of improving quarterbacks Matt Fink and Jack Sears. Both Fink and Sears gave a good account of their spring progress, but neither established that they are so far ahead of incoming freshman phenom JT Daniels that the precocious one wouldn’t be in line to be the starter at some point of the season – maybe sooner rather than later. If you: Didn’t attend USC’s Saturday’s final spring practice session, it’s likely that since Clay Helton had said before spring practice began in March there would be no decision made on the starting quarterback position until training camp in August, why bother to fight potential SoCal traffic to see in person the QB competition. Maybe you just said to yourself that you’d make the trek when the competition includes wunderkind freshman JT Daniels, who is expected to arrive on June 8. Yes, JT will be attending summer school, which also affords him the opportunity to participate in the players only summer practices on campus. BTW, Daniels spent Saturday standing behind the Trojans’ offense taking it all in and talking with Trojan quarterback coach Bryan Ellis. Nearby was future backfield mate RB Markese Stepp, the Indianapolis road grader and once a former Notre Dame commit, and under a tent monitoring the wide receivers ballyhooed incoming freshman Amon-Ra St. Brown, who aside from Daniels may be the best of the best of Clay Helton’s magnificent 2018 recruiting class. 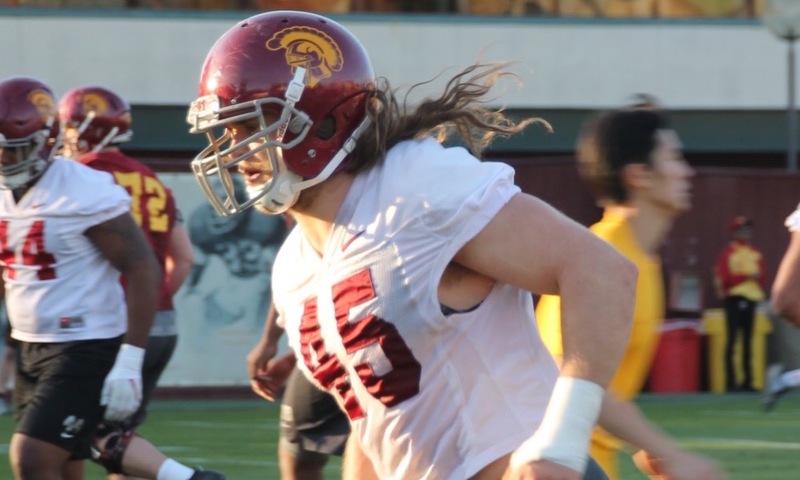 If you: Attended USC’s Saturday’s final spring practice session, you did get a general sense of how fast the Trojans are in the skill positions and a general sense that the offensive line is improved – not to mention the overall defensive looks improved because of returning senior starters like middle linebacker Cameron Smith, outside linebacker Porter Gustin (photo above), safety Marvell Tell lll, and corner Iman “Biggie” Marshall. If you: Didn’t attend USC’s Saturday’s final spring practice session, you figured you’d get a lot more information watching the Pac-12 Network’s coverage of Saturday’s spring practice than roasting in sun and sitting on those uncomfortable metal benches. Said Yogi Roth, Pac-12 analyst and former Trojans assistant coach under Pete Carroll to the national audience, “The offense will be good because they’ll run the football. It’s the best (USC) offensive line they’ve had in 10 years.” Did Roth’s O-line comment catch your attention? 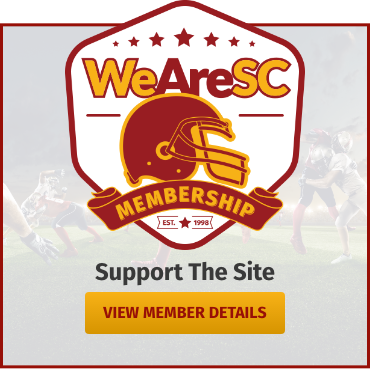 If you: Attended USC’s Saturday’s final spring practice session, you had to be impressed with the performance of running backs Aca’Cedric Ware and Vavae Malepeai, wide receiver Tyler Vaughns, and, yes, an improving offensive line. And special mention should go to sophomore tight end Josh Falo, who could be a real factor next season, especially if junior tight end Daniel Imatorbhebhe hasn’t recovered from his hip issues. If you: Didn’t attended USC’s Saturday’s final spring practice session in person, you really can’t appreciate the running back performances of Ware and Malepeai, who could be starters for most Pac-12 teams. Defensively, the aggressiveness of both standout freshmen like safety Talanoa Hufanga and linebacker Kana’i Mauga may not have given cable viewers justice to their promising future in the program. Of the overall defense, Pac-12 analyst Yogi Roth told the coach potato viewship, “It’s the best defense in the entire Pac-12 Conference, and it is national championship caliber. 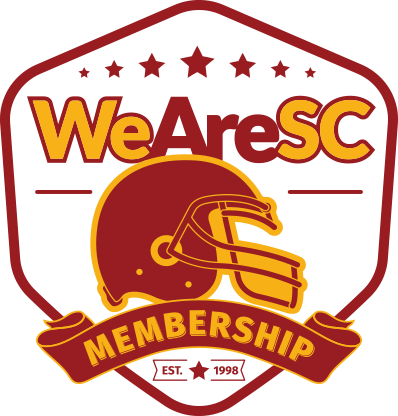 Overall, (USC) has the tools to compete for a national championship.” Start the hype machine! Sears speaks: Asked about his competition at quarterback with Matt Fink, Jack Sears said, “Both of us have done a good job pushing each other. I was trying (this spring) to develop as a passer. It’s night and day, just going from running the scout team in the fall to stepping in with the ones and getting all those reps.” Oh, and by the way, there were no noticeable pictures of either quarterback in the 68-page spring media guide. Helton quarterback analysis: In discussing his quarterback competition on Saturday, Clay Helton said, “They were efficient decision-makers and got the ball out on time.” You go the impression that Helton’s positive comments were measured for public consumption and may have been sprinkled with a bit of political correctness with the real competition of Fink, Sears, and the arrival of Daniels just months away. The TMB: As mentioned, the Trojans Marching Band showed up to raise the intensity of the final spring practice, and after practice the players ran to the band as “Conquest” was being played. In the final team huddle of the spring, the band was also included in the “brotherhood” as Helton gave his parting comments. Keith Jackson celebration: On Sunday afternoon at 4 p.m. at the Rose Bowl, fans are invited to attend a memorial service for legendary broadcaster Keith Jackson, who recently passed away. Gates will open at 3 p.m. and fans should enter into the Rose Bowl on the south end. Keith Jackson celebration – Part 2: Among the guest speakers paying tribute to perhaps college football’s greatest broadcaster will be Trojans’ athletic director Lynn Swann, former Jackson analyst buddies Brian Griese, Dan Fouts, and Tim Brandt, Roy Firestone, Ann Meyers-Drysdale, and the unofficial mayor of Pasadena, broadcaster, and former UNLV head football coach Harvey Hyde. Keith Jackson celebration – Part 3: During the Jackson celebration, Keith Jackson will appear in a video presentation, which should stir a lot of memories and emotions.